Los Alamitos is a small city in Orange County, CA. It is a relatively new city, incorporated in March 1960. This quiet city is home to the U.S. Joint Forces Training Base. It is also home to the National Comfort Institute, Inc. (NCI) Southern California Training Center (SoCal). 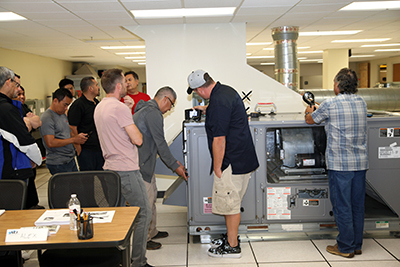 Located on Lampson Avenue in Los Alamitos, the training center is central to teaching and certifying more than 5,000 Southern California HVAC contractors in high performance contracting processes. NCI opened its SoCal training center in 2014. Its mission: create a state-of-the-art facility offering HVAC contractors hands-on and classroom training. This training includes certification in residential and commercial systems. Most importantly, it focuses the Performance-Based Contracting™, which goes beyond equipment. It includes ductwork as vital to the entire system. One of the classrooms in our training center holds up to 30 students. Here Jeff Sturgeon leads a class in Commercial HVAC System Performance. To illustrate this point, a Performance-Based Contractor™ delivers comfort, safety, and energy efficiency with proven documented results. Through what NCI calls total system diagnostics, customers see their system in a new light. They better understand the value of the HVAC services provided. 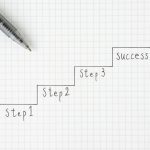 In other words, the performance-based approach teaches customers about their HVAC systems in simple terms. It identifies real performance issues and differentiates contractors from their competition. 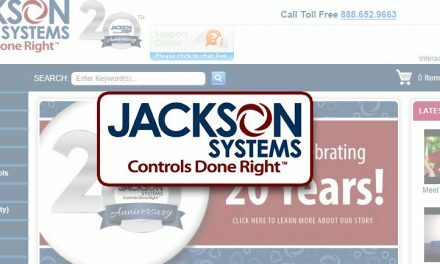 This approach proves to be a great lead generator and profit center for any HVAC business. 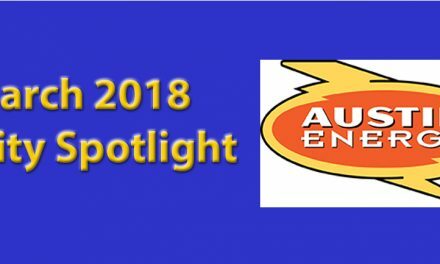 Jeff Sturgeon, senior trainer and manager of the Los Alamitos facility says they also work very closely with local utilities as partners in their energy programs. “We teach nearly all the classes the NCI offers as well as classes offered nowhere else in the country,” he explains. This demand control ventilation training station is one of seven simulators that are instrumental in understanding economizers and their controls. In fact, Southern California utilities subsidize NCI training as part of a statewide Workforce Education and Training (WE&T) program, according to Sturgeon. 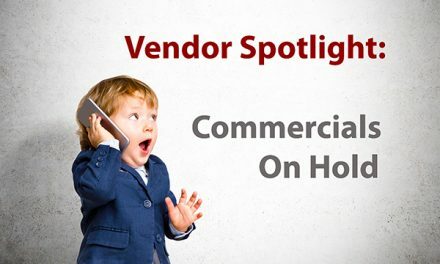 He has more than 30 years of experience in the HVAC industry and is well versed in all three major sectors: residential, commercial and refrigeration. 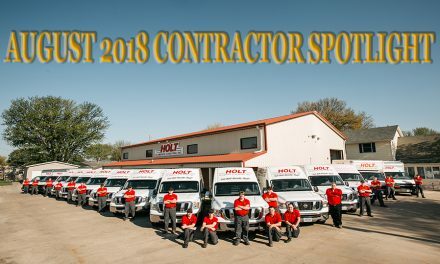 Throughout his career he installed and serviced residential, light commercial, commercial, and industrial HVACR systems. He also worked for an HVAC controls manufacturer where he was responsible for engineering, designing, building and installing control panels for a variety of applications. Sturgeon adds, “We also have a fully functioning hydronic system with dual pumps and cooling towers that allow a real-world training experience for the technicians. “In addition, the center has split heat pumps, a commercial package unit with an economizer, a split gas-electric unit that is fully operational with a traverse station, a Liebert computer room cooling system, and more. 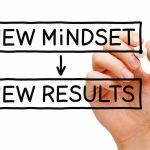 NCI offers cutting-edge training and coaching programs from both the technical and business, sales and marketing perspectives. On-staff experts like Sturgeon teach classes and work in the field, coaching contractors and working with technicians to solve troublesome problems with both residential and commercial systems. 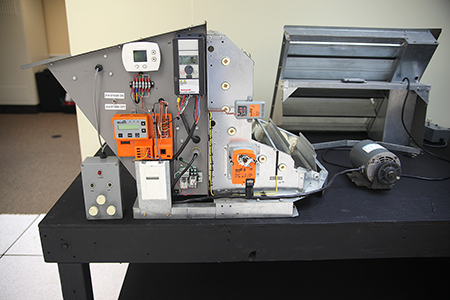 Based on their own industry experience and knowledge, they built seven fully functional simulators in the training center that are instrumental in understanding the economizer itself and its controls. 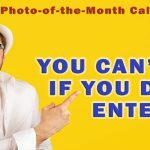 What is the Los Alamitos Unique Proposition? 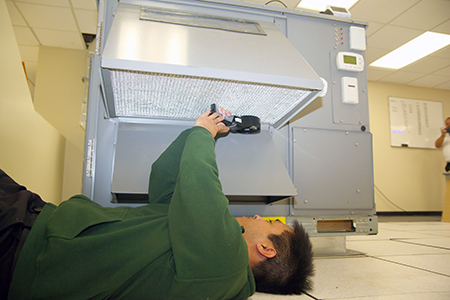 Pictured here are students performing hands-on testing of a commercial packaged unit. Meanwhile, Casey Contreras joined NCI with 10 years of residential, light commercial installation and service experience. He is a field coach based out of the Los Alamitos center who works alongside service and installation technicians. He also works with utility programs. “As a field coach, I work with contractors and teach them how to test and diagnose real-world issues and scenarios,” he says. Contreras, who also worked with many HVAC training organizations in Southern California, says the NCI facility is one of the most current, state-of-the-art facilities he’s seen. Finally, in his opinion, that is the Los Alamitos center’s unique training proposition. The overall mission of the Los Alamitos facility is help local contractors not only to deliver better efficiencies and comfort to consumers, but also to really train them in the skills involved in testing, measuring, and repairing. Contreras says this is what helps make HVAC professionals into true craftsmen. 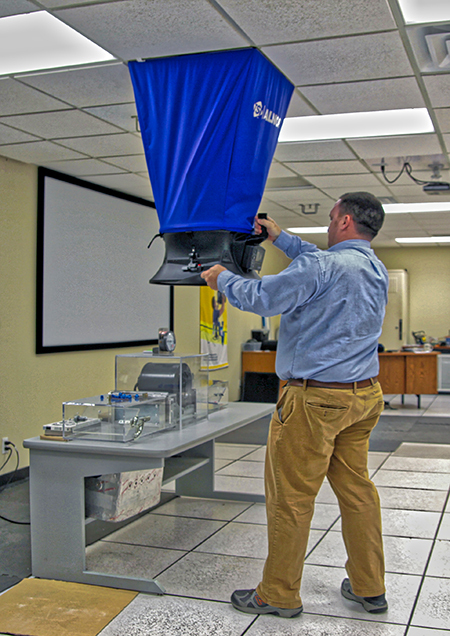 Airflow measurements with flow hoods are a key component of NCI’s High-Performance training. The proof that this mission is succeeding comes from students themselves. Contreras says students often tell them that NCI training really improves their diagnostic skills and their ability to solve comfort problems. He also says they see their sales closing rates increasing with higher dollar tickets revolving around duct renovations and air upgrades. “Our students tell us Performance-Based Contracting is making a big difference. When customers really listen to what our trained professionals tell them about their systems, it makes a lot of sense. “We’re finding that to be true in a growing number of cases. 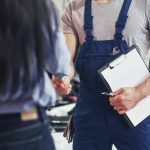 Consumers often get quotes from many contracting firms and if those contractors don’t talk about airflow and diagnostics, often they get dismissed and the NCI-trained contractor gets the job. Contreras adds that they see many repeat students who come in for refresher courses or to re-certify. 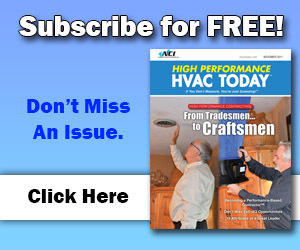 High Performance Contracting represents a small, but growing sector in the HVAC Industry. 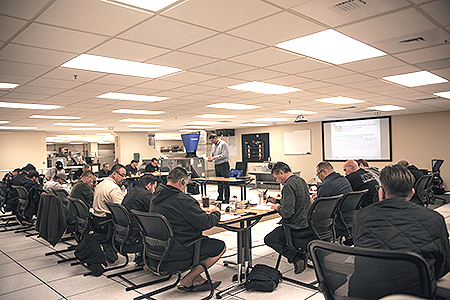 The Los Alamitos Training Center is one of two centers in the U.S. dedicated to teaching contractors that if they don’t measure, they’re just guessing and if they just guess, their customers pay more for less comfort. Don’t take our word for it. Just ask the contractors trained in Southern California.